Do you have a proclivity for sesquipedalian words? Has your prose become ossified because you haven't augmented your vocabulary lately? Here's the perfect pedagogical solution. 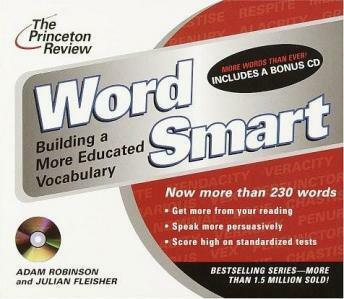 Word Smart Genius Edition teaches more than 150 of the most interesting and challenging words in the English language. Perfect for college students, professionals, wordmongers, crossword puzzle devotees, or just plain show-offs, Word Smart Genius Edition informs and instructs in a uniquely entertaining way. This book will be very useful to peole with insomnia. Did not keep my attention. Maybe it was me but I could not find the humorous, irreverent style! It was like watching paint dry, would not recommend it.